The Academy of Ancient Music/Christopher Hogwood. Eloquence is having something of an Emma Kirkby month! There have been five discs released for which collectors elsewhere may be rejoicing. Universal have restored some real Kirkby gems to the catalogue. There are discs of Mozart (2), Purcell, Handel and an Elizabethan Song Book. As most fans of hers are well aware, she has a bright, positive soprano voice with very little of the vibrato, which although fashionable at present, makes listening to many modern singers a disagreeable experience. 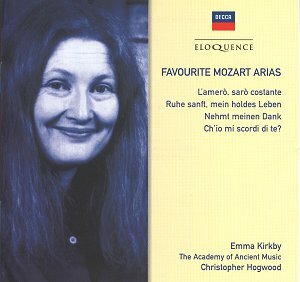 These recordings, done in London, catch Kirkby early in her career and as such are extremely welcome; in fact indispensable. This disc collects together concert arias - not arias from the popular operas. These were written by Mozart to show off the female voice, and on the evidence here, they certainly do that. Il re pastore, was first performed in Salzburg, and was intended to capitalise on the singer�s ability to progress from modest lyricism to increasingly virtuosic display. It is not known whether Archduke Maximilian Franz was impressed or not � certainly he would have been if he had been listening to this performance. Emma Kirkby has the ability to make this repertoire seem effortless, and she is ably aided and abetted by Hogwood and his orchestra. In addition, the Decca recording has been superbly transferred. Once again, Eloquence seems to have tapped a missing part of the market, since although this disc was originally issued in the UK by L�Oiseau Lyre on 425 835-2-OH, it does not appear in the current Universal catalogue, so presumably has fallen under the deletions axe. The general catalogue is groaning with other Emma Kirkby recordings, and she has been very active for Hyperion and companies other than Universal for some time. These early recordings are therefore especially welcome, as at super budget price, collectors who may have missed them first time around should be able pick them up without delay. The next four arias KV 217, 272, 344 and 383 show off our soprano�s bright clear voice admirably. I predict that there will be some very happy collectors out there who obtain every possible enjoyment from it. The only part of this disc that I was least bit hesitant about was Ch�io mi scordi di te? KV 505. Unlike all the others, which have The Academy of Ancient Music for accompaniment, this aria has Kirkby accompanied by Steven Lubin at the fortepiano. Perhaps you not share my abhorrence of this instrument ... although why use it when there are perfectly good Steinways and others around do not sound like upright Joannas. I know I am in a minority here, particularly for this type of repertoire, so don�t feel short-changed. This is a superb issue, and deserves wide circulation.